A smaller cousin to the Preseli Beast which runs over parts of the UtraBeasT route covering the eastern end of the Preselis. This will also be a South Wales championship counter for 2019! This 7mile marked fell race is all off road with approx 1,250ft of ascent, and starts and finishes on a minor road 1 mile from Mynachlog-ddu towards Rosebush. GR 127 307. SA66 7SN. Just below Carn Sian, and near the smallholding of Dan-y-Garn. The route itself has a gentle’ish uphill start before dropping over the northern side of the Preselis on brilliant grassy singletrack. It passes above the rocky Carn Coedog, before visiting the impressive rocky spur of Carn Alw. From here the route goes across the ‘dead marshes’, to tackle the iron age hill fort of Foel Drygarn. The route then makes it’s way back via where the reported stonhenge bluestones originated from. You’ll see why when you run through them! The route then has one ‘gentle climb’ back towards Carn Sian, running through the stone circle of Bedd Arthur on the way. The drop off the hillside to the finish can be quite of a thrill ……..if taken at speed! Entry is £5 on the day, with tea and cake afterwards too. 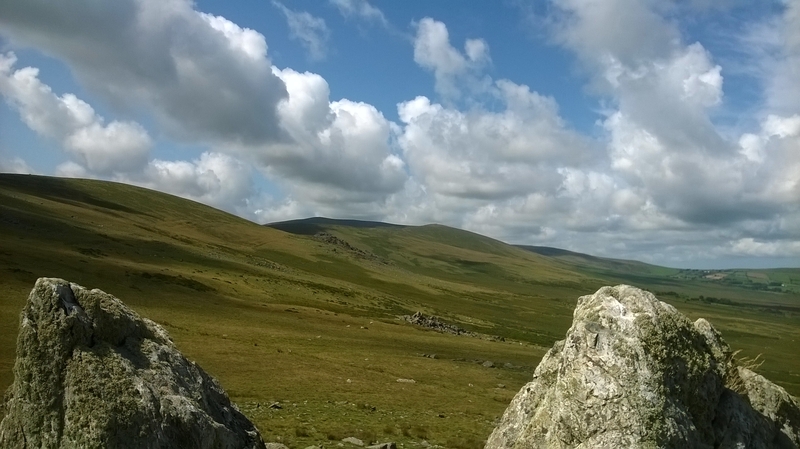 This race makes up the series which includes the Carn Ingli killer and Foel Cwmcerwyn race. Best two results of the three to count. The race is a category BM, which means you’ll need to bring a windproof(waterproof if raining), and a whistle as a mininum. There are also 3 marshalling points which will be shown on a map at the start. The map of the route can be found here – http://gb.mapometer.com/running/route_3970771.html This allows you to view the map in different formats as well as zooming in! Thanks to all who ran in previous races races. Showing off the prizes just after I’d marked the route! Look at the weather!!! James Thomas retained his title and also beat his own record! Great running was done by all, 2nd overall was M40 Daniel Hooper from Sarn Helen, 3rd overall was the flying M50 David Warren, 1st four were under the hour, and everyone was home under 1 1/2 hrs! Tidy. 😉 Tasha Sexton retained her female title, Hazel Davies(oldest runner!) was 2nd female overall, whilst Domi managed to lose her way and ran a few extra miles……..on the road, and still finished down the finishing funnel! Free tea and cake for all at the end, and 1st in each category chose their alcoholic beverage of their choice. Prize giving and all the other runners. Thanks for travelling down to run, but a special thanks go to the helpers-James for marshalling, sweeping and pulling up the markers; Richard, Louise and Eliza for Foel Drygarn marshalling and photo taking, sisters Eirlyn and Lynwen for tea and cakes; Carolyn, Rhyds and the boyz for timekeeping and encouragement. Spare money from the race will be donated to the Mynachlog ddu playground association. The weather couldn’t have been better for the second running of this little beauty of a route. The amount of ascent isn’t as much as some of the other tough fell race out there, but it’s technicality certainly makes up for that. 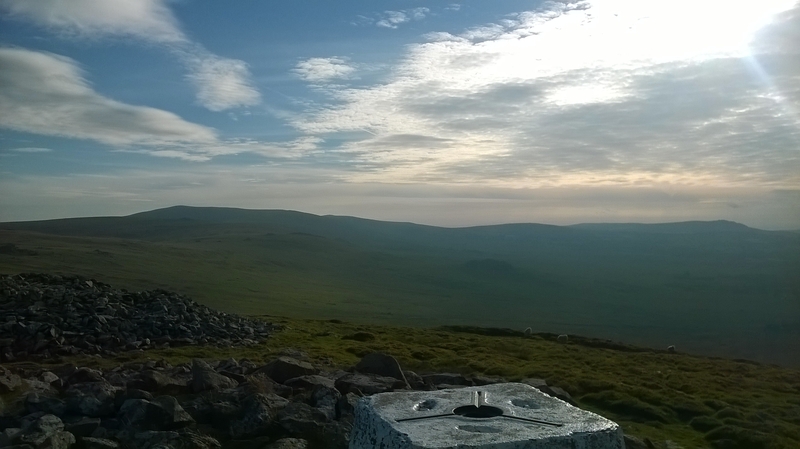 Two runners headed the pack until the halfway steep climb up to Foel Drygarn, but this is where the fell running experience of Alex Lewis came into it’s own and left local lad Darren Thomas for 2nd place, but managed to hold on to 1st M40. M60’s ‘local lad on fire’ Malcolm Clash is enjoying his running at the moment and came in a brilliant 4th place. He was closely followed by returning to form local lass Tasha Sexton who took 1st lady and F40. 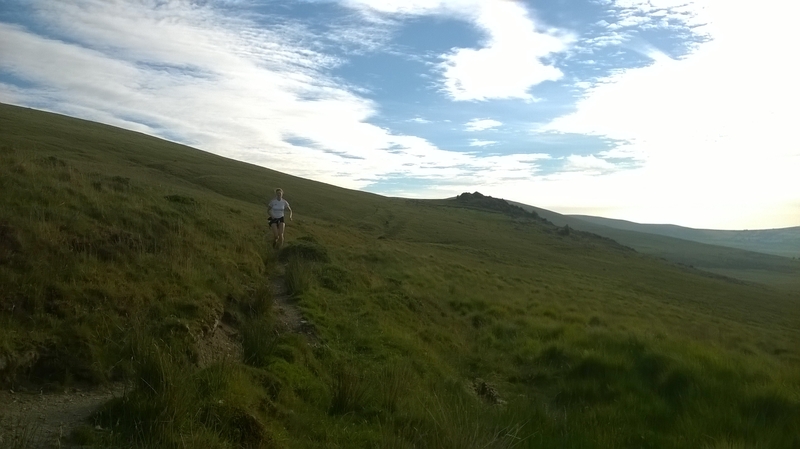 Another M60 runner followed in the form of Dic Evans who had travelled from the Ystwyth valley. I thought he’d travelled far until I got talking to Alec Showell……..from Cornwall! 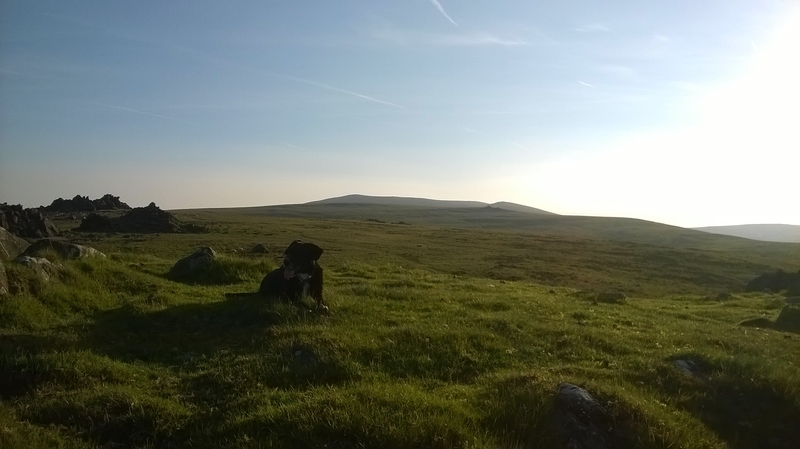 Alec had seen the race in fellrunner magazine and decided that he’d come up for it and stay a few extra days as he’d never been on the Preselis! That’s commitment! His words were after he’d finished “I’ll definitely be coming back next year. What a cracking race”. 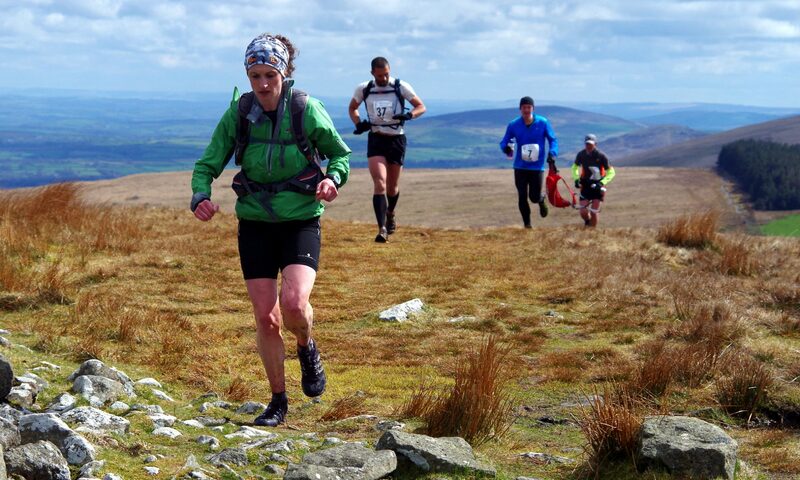 Local lady Jane Wilkins who probably knows the Preselis pretty well by now took home the F50 category. Thanks to all the runners who ran. A huge thanks has to go to the marshals out on the checkpoints, and to little Megan(the admin lady)who helped make this race happen. Everyone enjoyed the tea and cake afterwards in the lovely sunshine. The category winners took home a bottle of ale or a big bar of chocolate! Nowt like the diet of a proper runner!